From Facebook Friends to Great Friends, Midwest Retreat was an extraordinary experience. 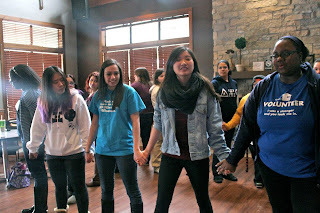 Being a senior in Delta Xi Phi, I was extremely excited that I would finally be able to attend the Midwest Retreat. The retreat was held at Alpha Chapter at the University of Illinois in Urbana-Champaign over the first weekend in March. This made me that much more excited because not only am I from the Urbana-Champaign area and I got to see my family for the first time this semester, but we got to take it back to place where it all started; where the 15 BEAUTIFUL Founding Mothers of Delta Xi Phi decided it was time for a change. Once most of everyone was there, the lovely ladies from National Board, Theresa and Cassie, separated us into Buddies. At first I was hoping to be placed with someone I was already pretty good friends with as I knew we had a lot to gossip about. I was placed with Sarah Scisson from Phi (S/O to TEAM DOUBLE TEAM. Boom!) and immediately connected with her. She’s the Avani to my Na’ima. She’s my buddy for life. Others expressed the same reactions to their buddies. Brittany Waryjas says that receiving her buddy was her favorite part about the retreat. I believe that having a buddy gave us the opportunity to know more about a sister from a different chapter and be able to cross those divides that lots of Greek Organizations have. We were able to learn the strengths and weaknesses of our chapters and how to build from them and see how other chapters have been successful. Going into this retreat, I thought that older members like myself would be doing a lot of the talking. We had the most experience, the most knowledge about Delta Xi Phi and having a retreat like this would make a good experience for the newer members to learn and grow. But that wasn’t the case which I was happy about. Even being an older member I still have so much to learn not only about Delta Xi Phi but about myself. I think that’s what a lot of people take for granted when they join such an amazing organization. We lose the idea of what it means to be a sister, which everyone has their own definition. To me, being a sister of Delta Xi Phi is about educating yourself and others about your culture and other cultures around you. It’s about being accepting and open minded. We know that you don’t have to believe in everything that every member does, but you have to accept that that’s what they believe even if you think it’s wrong. Ritual is a big part of being a sister as well. It really shows you where we’ve been and how far we’ve come. The workshops were a perfect way to talk about the different parts of being a sister. Theresa had a very interesting topic called Intersectionality. It’s something I had never thought about, but it is an issue within today’s society. We discussed the social inequalities that are caused by lumping different aspects of a person that that specific person identifies with. We talked about the idea of being colorblind and how this can affects children and young adults of all ages. The workshop that the Alpha Chapter sisters put together, led by Ari Mann, really helped continue this communication. We talked about sisterhood and how to strengthen the ties that we’ve built with the sisters in our chapters and sisters nationwide. We learned more about our buddies and the other sisters at the retreat as we developed better communication with each other. This worked perfectly into our third workshop, led by Cassie Giocosa, about Feminism as it created a comforting atmosphere to have this discussion in. I loved the comments some people made about how not all feminism is necessarily good feminism. Sisters shared their positive and negative experiences with the ideas that encompass feminism. We discussed the different types of feminism, sexuality and I added some more letters to my LGBT Alphabet. For most, this topic was something that is very “hush hush,” but having this discussion with my sisters was empowering and I feel like we were all pretty comfortable asking questions and sharing stories because we knew our sisters wouldn’t judge. Being a sister of Delta Xi Phi is more than showing up to chapter and mandated events. It’s about WANTING to be there not only for those events but for each other. I joined Delta Xi Phi because I had no one at Marquette. I found my family in Delta Xi Phi and I’ve never been happier in my life. At Midwest Retreat we strolled, we laughed, we learned and we grew closer together. This being probably my first and last retreat as an active of Delta Xi Phi, I can say that I wouldn’t trade the time I spent with my sisters for anything in the world.